Click to Email / Or Call 01494 716947 Genuine email enquiries are always responded to within 24 hours. If you do not get a reply please assume your email was not received and call instead. 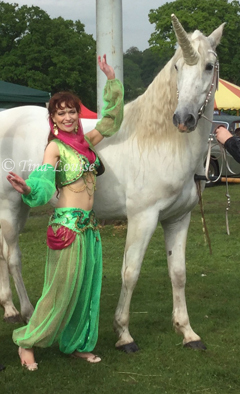 Tina-Louise is an experienced, professional Egyptian style Belly Dancer, based in High Wycombe, Buckinghamshire UK. Available to hire for events, parties and stage shows. Began Belly Dancing in 1995, and established her own dance school and performance troupe in 2001. Performs internationally, has entertained dignitaries and celebrities and appeared on UK primetime TV: BBC1 (The One Show), Channel 4 (Celebrity Come Dine With Me), and Sky 1 (Got to Dance). Has been resident Belly Dancer in several establishments including 9 years as the exclusive resident dancer at a popular restaurant. Performs extensively at private and corporate functions, celebrations, public and community events and stage shows. Has given over a hundred talks and demos to groups like the WI, U3A, Women's Guilds, Brownies and Guides etc. Provides Belly Dance & Hawaiian Hula children's party entertainment; and Taster Lessons for all sorts of groups from hen nights to medical seminars! Has organised, produced and directed a number of professional stage shows, cabaret nights and other events involving her troupe The Bellyrinas® She and the troupe also perform for weddings, parties and various other private functions as well as community festivals. Note: Tina-Louise provides family entertainment suitable for all ages, and will not perform for all male audiences, or for groups of fewer than 5 people. AREAS SERVED: Events located within 25 miles of High Wycombe Buckinghamshire and West & Central London. Available for all kinds of private and public events, restaurants, hotels and stage shows. SOLO BELLY DANCE PERFORMANCES: Performances are usually 10 minutes or 20 minutes and you may book one or more performance. Each performance is in full cabaret costume and includes props (space permitting) such as Finger Cymbals, Veils, Isis Wings and Veil Fans. Audience participation and interaction can be included as required, or you may book a mini-lesson to follow the performance if you wish. Photos with guests after performance are complimentary. Music and audio equipment is provided by Tina-Louise. 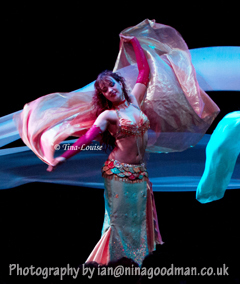 TALK & DEMONSTRATION WITH OPTIONAL AUDIENCE PARTICIPATION: (Belly Dance or Hawaiian Hula). About one hour in length, suitable for groups/clubs etc. A brief performance in full costume with props, followed by an explanation of the dance, it's history and many health & fitness benefits, and a talk about Tina-Louise's experiences of teaching, performing and her troupe The Bellyrinas®. Optional audience participation is encouraged in some simple movements. Costume display, photographs and film accompany the talk. Tina-Louise is a registered speaker for Buckinghamshire Women's Institutes and will charge a reduced fee for WI groups and similar organisations, state schools and children's organisations, if located within 15 miles of High Wycombe. CHILDREN'S PARTIES: (Belly Dance or Hawaiian Hula). Similar to the 'demonstration' above, but timed and tailored according to age, and a bit more fun! Brief performance, a short fun interactive talk, lots of participation and a gift for every child. TASTER LESSONS/WORKSHOPS FOR GROUPS: Popular for Hen and Birthday parties, girl's nights and team-building events. Available options are: Belly Dance, Hawaiian Hula, Bollywood, Charleston, Disco, 60s Go-Go style, or a mixture of your choice. 1 hour or 90 minute options, providing a taster of basics and a fun upbeat routine, tailored according to age and ability of participants. You may arrange your own venue which should be of an adequate size for the number of participants, or request the use of one of Tina-Louise's class venues, the room hire will be added to the booking fee. POSTERS / FLYERS / PICTURES: Advertising material for your event can be provided when you book Tina-Louise/The Bellyrinas®, please ask for details. MORE THAN ONE DANCER REQUIRED? : You may hire two or more dancers for your event. Please click here to find out more. All genuine emails are responded to promptly within hours, so if you have not received a reply within 24 hours and have checked your junk/spam folder, please assume the email vaporised and call instead. If the 'email' link above does not reveal the address in your mailware, please call instead. (The address is hidden to avoid spam). To confirm your booking you will be required to complete a booking form and pay a deposit. Dates/times are not held until both are received. Please book as early as possible as Tina-Louise has extensive teaching and dancing commitments in place many months in advance. Bookings can be made up to 18 months ahead. It is very unlikely that bookings with less than 10 days notice can be accommodated. Before enquiring, please be advised that the minimum booking fee is £100, rising according to requirements. If your location is beyond 10 miles/30 minutes of High Wycombe, travel (petrol AND time) is charged for in addition as Tina-Louise does not ride a magic carpet. This will be higher on Saturdays as travel prevents other bookings being accepted at peak time. Fees for private events are fixed and non-negotiable. A list of fees is supplied when you make your enquiry based on the information you provide. Don't forget to state the venue & postcode so travel can be quoted. Commercial bookings made by hotels & restaurants may be offered a special fee rate according to the terms of the engagement and venue location. Tina-Louise is a professional and experienced performer and instructor who accepts fee paying bookings only and does not perform or attend events for free or for incidental expenses. Tina-Louise is a full-time professional Belly Dancer and instructor, but originally graduated in Costume Design & Supervision for Film, Television & Theatre, and holds qualifications in general art & design, fashion, corsetry, jewellery design and computer aided design. As well as dancing, Tina-Louise produces and sells a range of jewellery, accessories, apparel, and glassware. Tina-Louise designs and makes all her performance costumes, all her troupe's Hawaiian/Tahitian costumes and some of the troupe props. She designs, helps and directs the members of her troupe The Bellyrinas® to make their own bespoke Belly Dance costumes which are exclusively used for The Bellyrinas® performances under licence. 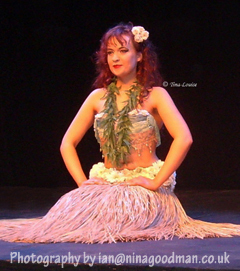 Tina-Louise has studied and performed tap-dance, singing, various styles of Belly Dance, Hawaiian Hula, Tahitian Dance and Burlesque, and can play the Ukulele (perfect for Hawaiian events). She seeks to continually expand her performance repertoire through the learning of other dance forms and additional stage skills including the use of various props, circus skills, magic and illusion. See more of Tina-Louise in the gallery. High Wycombe Belly Dancer, Marlow Belly Dancer, Beaconsfield Belly Dancer, Slough Belly Dancer, Windsor Belly Dancer, Maidenhead Belly Dancer, Henley Belly Dancer, Bourne End Belly Dancer, Gerrards Cross Belly Dancer, Denham Belly Dancer, Iver Belly Dancer, Burnham Belly Dancer, Princes Risborough Belly Dancer, Thame Belly Dancer, Aylesbury Belly Dancer, Missenden Belly Dancer, Chesham Belly Dancer, Amersham Belly Dancer, Berkhamstead Belly Dancer, Rickmansworth Belly Dancer, Buckinghamshire Belly Dancer, Berkshire Belly Dancer, Hertfordshire Belly Dancer, Belly Dancers, United Kingdom, Buckinghamshire, Berkshire, Hertfordshire, Oxfordshire, Middlesex, London, High Wycombe, Beaconsfield, Slough, Windsor, Eton, Maidenhead, Reading, Henley, Marlow, Amersham, Chesham, Aylesbury. 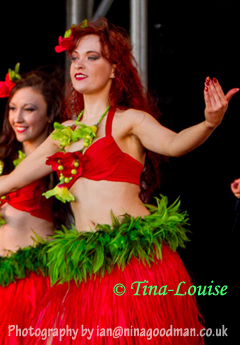 Hawaiian Hula Dancers England, Tahitian Dancers England, High Wycombe entertainers, Buckinghamshire entertainers, hen parties, wedding entertainment, dance classes, fitness classes.